Semiconductor Engineering - 10 Years Later—Will Project Delays Stop Faster Technology Innovation? Semiconductor Engineering - 10 Years Later—Will Project Delays Stop Faster Technology Innovation? Home > System-Level Design > 10 Years Later—Will Project Delays Stop Faster Technology Innovation? 10 Years Later—Will Project Delays Stop Faster Technology Innovation? We need to mix tools for better planning and management of verification to ensure users meet their schedules. Every January I enjoy looking back 10 years to learn from the past, consider implications for the future, and have fun picking the worst prediction that did not come true. This year I even can combine my annual trip to the garage where I keep some January issues of IEEE Spectrum with reviewing my own blogging. Five years ago in 2009, I did my first “10-year-lookback” that I called “Back to the Future.” I was quite stunned at the time to see that back in 1999’s January issue of IEEE Spectrum, we had already talked about higher levels of abstraction and hardware/software co-design. Wilf Corrigan, at the time CEO of LSI, was quoted that the most pressing need for new EDA tools is a better methodology “to allow software developers to begin software verification more near the same time that chip developers begin to verify the hardware.” Holy time machine, we are still working on that! Or was Wilf just very early? 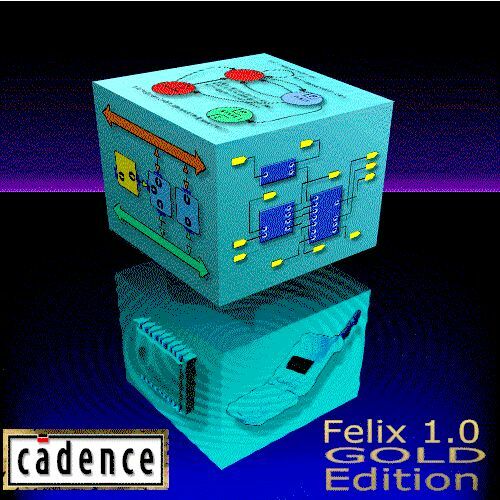 I vividly remember 1999 as I was a technical marketing lead on Cadence’s Felix project that had the ambitious objective to solve exactly Wilf’s hardware/software co-design challenge. When digging for my IEEE Spectrum in the garage, I ran across the Felix 1.0 CD cover we designed, which I share here for vintage value. The graphics design team did a great job showing architecture, function, and software, mapping into chips and systems mirrored in the bottom. Hey, flip phones were all the rage back then. Back in the garage, I found two review-worthy magazines from January 2004—IEEE Spectrum’s forecast issue called “Winners, Losers, Holy Grails” and an Economist issue called “The world in 2004.” Next to predictions how European economies would perform—at the time apparently the UK was doing great, a pre-Merkel Germany was stumbling a bit, quite a change we have seen over the last ten years here—I enjoyed an article about Boston’s “Big Dig”, the mega project that re-routed the central highway I93 into a 3.5 mile tunnel and extended I90 to Logan International Airport with the Ted Williams tunnel. I am writing this on my flight back from Boston to the Bay Area, trying to escape the minus 11F wind-chill perceived temperatures—come on, seriously? The Economist’s forecast issue mentioned that the “Big Dig” should be finished in early 2004, but Wikipedia clarifies that it indeed took to December 2007 to conclude the project. Official planning had started back in 1982, construction started in 1991 and the most expensive highway project in the US was “plagued by escalating costs, scheduling overruns, leaks, design flaws, charges of poor execution, and use of sub-standard materials, criminal arrests” as well as one death. At the end it had a cost overrun of 190% and will not be paid off until 2038. Ouch. Which reminds me of the construction of the new BER airport in my hometown Berlin, Germany that could not open a couple of years ago in 2010 due to fire security issues and today still has not even an estimated date of completion. Aua (German for ouch). As embarrassing as these planning mistakes are, are we doing any better in electronics? Perhaps not. According to the UBM/EETimes “2013 Embedded Market Study,” only 38% of embedded projects are completed on schedule, down from 40% in 2010. With 5% ahead of schedule and a whopping 57% of projects completed behind, 12% of them are more than six months late or even being canceled. What about technology innovation? In the Economist’s forecast issue a side bar claimed that in 2004, the “sales of DVDs could hit $25 billion, more than five times those of video cassettes.” Well, according to the IHS Screen Digest, 2004 actually became the all-time high for consumer spending on video and the graphic here is a stern reminder how fast technology innovation is accelerating: on-demand video cuts of portions of video rentals, Blu-ray comes in to cut off parts of the DVD market, etc. I had myself in a previous blog post mused about acceleration of innovation in “Putting Kurzweil’s Singularity to the Mobile Test.” The acceleration of technology innovation that we are experiencing is nothing short of mind boggling and I still hope that we not all turn into pumpkins when Kurzweil’s Singularity hits in 2045. Well, at least the Big Dig will be paid off and hopefully BER is opened by then. My favorite winner and loser though can be found in the category “Computers.” The article “A Fountain of Knowledge” talks about opening up online information for commercial exploitation, which seems to be directionally right on with what we call Big Data Computing today. Reading about the predicted loser in “A Dog Named Spot,” I must admit that I had completely forgotten about Microsoft’s Smart Personal Objects Technology (SPOT). The digital wristwatch Microsoft had built together with Fossil seems a predecessor to some of the devices today enabling “The Internet of Things” as sensors at our wrist. The analyst’s commentary that “given the proliferation of other devices that can surf the Web and give you personalized information, and the fact that a lot of people who own watches also own one of those other devices, there’s a concern that there’s a limited group of people who will say, ‘I want my watch to be more,’” does seem harsh from today’s perspective. Bill Gates’ project was just too early for its time and perhaps tried to bite off too many things in parallel. Microsoft had to develop both the smart watch at out wrist itself, as well as the infrastructure by creating a Microsoft network called “DirectBand” at about 12Kb/s using FM subcarrier bandwidth. With today’s data bandwidth available almost always and almost everywhere, this infrastructure challenge has been solved with our cell phones. It turns out that Microsoft’s SPOT watches were discontinued in 2008. MSN Direct service continued to support the already sold SPOT smart watches until December 31, 2011, when transmissions ceased. So where do project delays, project failures combined with ever accelerating technology innovations, some of them too early for their time, leave us in the area of electronic design automation tools? I stand by my thoughts in last month’s blog—software continues to grow in importance at all levels and we will must continue to address Wilf Corrigan’s 1999 challenge. Perhaps we also need to mix in tools for better planning and management of verification aspects that allow users to check whether they actually meet the schedule that technology innovation requires these days. Bottom line? We have interesting years ahead!